Home > Vitamins & Your Health > Do You Need More Vitamins When You Are Ill? Eating a healthy and balanced diet is important when people are ill – it can be especially important when people are ill, to help them get better more quickly. Taking drugs when ill can also affect the levels of vitamins that people’s bodies need. It’s easy not to eat properly when feeling ill, especially if it’s a stomach bug, and so you may miss out on some important vitamins. If possible, pick plain and easily digested foods that are high in vitamins and other nutrients. Any form of illness can stop people feeling hungry. Something that smells and tastes savoury, such as yeast extract/marmite on toast, or a bowl of chicken soup that includes lightly cooked fresh vegetables, can tempt the appetite and also includes the much-needed vitamins. If the thought of any food is too much, fruit juice provides vitamins and fluids, along with fruit sugar for energy. The effectiveness of some drugs for particular illnesses can be affected by levels of vitamins in the diet, and other drugs can change the body’s need for vitamins, and so people may need more or less of particular vitamins when they are ill - see How Drugs and Foods Interact With Vitamins. For example, the vitamin B complex can make tetracycline antibiotics less effective, and some antibiotics can increase people’s need for niacin, one of the B vitamins. 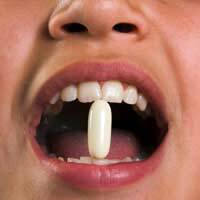 Isoniazid, which is used to treat tuberculosis, can make vitamin D more active in the body, so increasing the amount of calcium in the blood. It is possible to get the right levels of vitamins from supplements, and they can be a helpful when not eating properly, but in general, it seems that vitamins from food are better than vitamins from supplements - see Are Vitamins in Food Better Than Supplements?. So rather than taking an extra vitamin supplement, focus on eating fruit and vegetables, whole grains, and low-fat proteins, such as lean meat or fish, tofu or Quorn. Unsalted nuts and seeds are a healthy and low-salt snack, and provide vitamins, protein and fibre. Many people believe that taking extra vitamin C prevents colds. Studies have shown that it doesn’t – however, it may help colds get better a little (but only a little) quicker. Do not take too high a dose, though – too much vitamin C can cause diarrhoea and can lead to painful kidney stones. Taking vitamins in doses that are too high (megadoses) can make people ill – for example, too much vitamin A can cause sickness, diarrhoea, headache and dizziness. Check that the vitamin supplement only provides up to or around 100% of the recommended daily dose, and take the tablets as suggested on the label. Some illnesses are caused by not having enough vitamins in the first place. Though these are rare in the developed world, it is important to eat a healthy and balanced diet and get safe levels of exposure to the sun to avoid developing vitamin deficiencies.